The husband and I chose a Saturday (wrong move because it took us more than 3 hours to clear immigration and to get across a heavily congested causeway!) to come into JB for a day out as we wanted to shop and watch movie at AEON Tebrau City (formerly known as Jusco). One good reason for coming all the way to JB to watch movies was of course due to the Singapore dollar staying strong against the Malaysian ringgit so shopping or dining there was a real bargain. Besides that, what I really like about going to AEON Tebrau City is that the TGV Cinema has comfy seats and better popcorn compared to the Cathay @ City Square or MBO @ KSL City. The mall is huge and spacious but not as crowded as the other shopping centres so it’s so much nicer to walk around. The AEON supermarket there sells a wide variety of hot snacks and light bites (their fried calamari is bagus!) that we can ‘smuggle’ into the cinema, lol. There is also a huge Tesco hypermarket (almost like a little mall on its own with various independent shops and eateries in the same building) just opposite AEON too and that’s where I love to go to stock up on my various spices and condiments that I often use in my cooking because it carries better selections of imported brands than other supermarkets there which focus more on local products. On previous occasions, we would take the taxi from City Square to AEON Tebrau City which would cost about RM20-25 per way depending on traffic conditions. And if the driver didn’t go by the highway (intentionally or unintentionally), we would sometimes get stuck in traffic for about 40 minutes which was so not worth it. Now, there’s no reason to fret as there is a new shuttle bus service that takes us from JB Sentral to AEON Tebrau City in just 20 minutes at an affordable fee of RM2.50 per person per way. 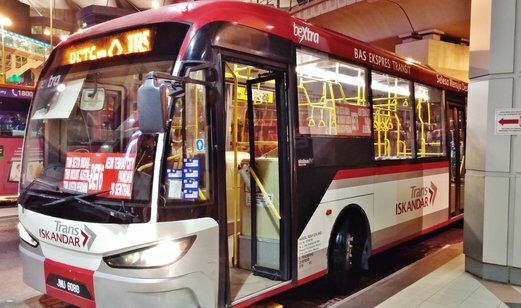 At the bus terminal, look out for this red-white Trans Iskandar Bus BeXTRA6 or BET6 which is a bus service by Causeway Link group. 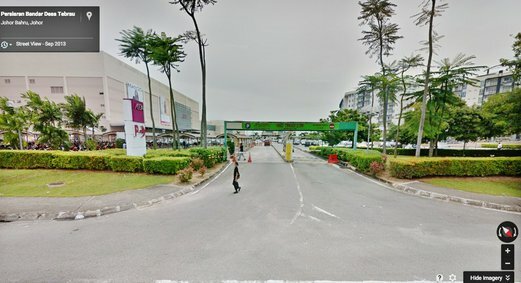 The drop off point at AEON Tebrau City is along the main road (where the carpark entrance is) just outside AEON as the driver explained the bus was not able to drive directly into AEON yet because of the current upgrading works of the carpark and also their bus company had not officially received the approval from AEON management to do so. If you’ve never been to AEON, just ask the driver to notify you when the bus has reached so you know when to alight. 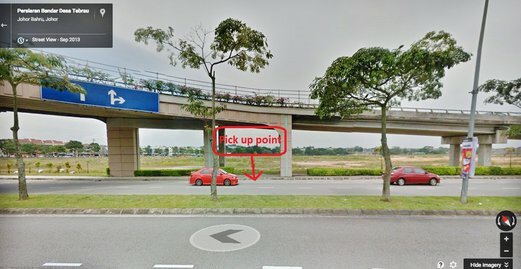 As for the return trip from AEON Tebrau City to JB Sentral, the pick up point can be a little dodgy because it’s located right under a flyover along the main road, Persiaran Bandar Desa Tebrau just outside AEON (diagonally opposite the drop off point on the other side of the road). From the exit next to AEON supermarket on ground level, turn right and walk all the way towards the main road where the carpark entrance is. (This is also the same drop off point as mentioned earlier) Do note the current carpark is undergoing upgrading works so there may be barricades around. Cross the road to the other side where the flyover is. Waiting point is as indicated above. I suggest that if you’re taking bus back to JB Sentral, please do so before 7pm while there is still some daylight because the pick up point can be dark and unsafe as there is a large piece of abandoned land just behind with no proper street lights. I would not recommend solo travellers to take the bus unless there are already some people there waiting for the same bus. We waited for quite some time and it was almost turning dark after 7pm but we were joined by another Singaporean family so it wasn’t too bad as we had company. Just remember to flag down the bus when you see it coming, otherwise the bus wouldn’t stop for you. Travel time back to JB Sentral is about 20 minutes too as the bus travels the same route back. Ok folks, this is it. Just a friendly reminder to be vigilant at all times and safe travels! my plan is : buy OSIM massage portable chair (OSIM uCaress 3D) at AEON Tebrau Johor Bahru , and bring it to Jakarta, Indonesia my home land via Singapore , because my Hotel stay is in Singapore at Bugis. Q : is it OK for Customs Clearance / immigration at JB to Singapore and Singapore to Jakarta for bringing OSIM portable massage chair (OSIM uCaress 3D) ? I’m not the right person to approach regarding this. It’s best that you find out more info from the Singapore Customs (http://www.customs.gov.sg/) website or just call up their customer service line. Any idea on how to go from JB sentral to AEON Kulaijaya and Bukit Indah cinemas? I’d like to explore Bukit Indah (also under AEON, i think ) cinemas also … but i think it’s quite far away from JB CIQ ? There are buses from Jurong East/Boon Lay (CW3 and CW6) that go to AEON Bukit Indah and the Tesco/Giant near it if you intend to go anytime soon. There may not be any direct CWL bus from JB Sentral – all I heard of are their local bus companies which I’m not sure if they still go there. No guarantee I’ll be heading to Bukit Indah (depends on how convenient it is to get there) but if I do, I will definitely share the bus route. Cheers. Then I met another guy who mentioned that I can walk further down the road and take other buses going to JB Sentral… so off I went and I reached this bus stop that is also under this flyover… I took the first bus that came along (BET 2) and I reached JB Sentral in 20 minutes..
What are the buses that return to JB Sentral? BET6, BET 2, ETC…? Do note the pick up point for Bet 2 that JA has mentioned is not located at the same spot as highlighted in my post. I have not personally explored that so I can’t recommend it. Safe travels! Thanks Geri. Whats the frequency of the bus Bet6? Rm2.5 per pax? No fixed timing but shouldn’t take longer than half hour. I waited for about 20 minutes when I was there 2 weeks ago. 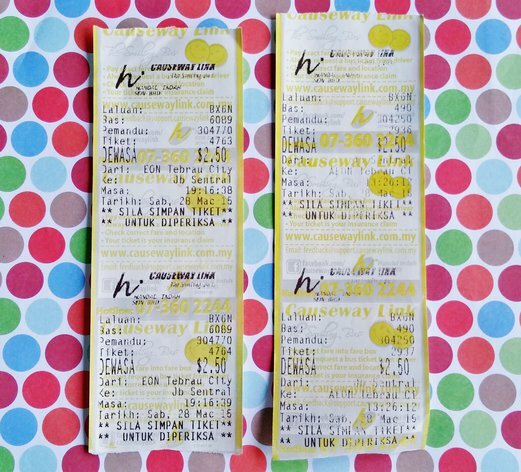 Bus fare remains the same and yes, that’s per pax per way. I took bus BET 6 (I think so) and the bus dropped me off at a bus stop opposite Skudai Parade Mall. Then, I crossed the overhead bridge to reach the mall. There are 6 levels in the mall … most of the shops in the top 2 levels have closed …very few people there… seems very quiet.. There is roller blading, billiards, KTV, bowling and cinema (Ticket prices for English movies seem the cheapest that I know so far .. RM 14) Also has Macdonald’s and KFC. There is a bus stop just outside the mall near the overhead bridge to return to JB Sentral. I also went Plaza Pelangi mall last weekend.. this mall is quite close to JB Sentral. I took bus 227 (I think so) and the bus dropped me off at a bus stop opposite Plaza Pelangi mall. I crossed the overhead bridge and reached the mall. There are 3 levels in the mall. There is a Macdonald’s restaurant there and some shops. I have to wait under the overhead bridge for the bus back to JB Sentral. Hi Geri . i am kate ., would like do u know what bus to take for Aeon terbau city back to Johour baur custom? Hello Kate, please refer to this blog post again. I have detailed all useful info on the to and fro trips including pick up points. Safe travels and have fun in JB! Then I walked out of Angsana Mall and walked under the flyover to reach a bus stop near to GIANT and crossed that same overhead bridge earlier to return to the same bus stop the bus dropped me off earlier … I waited for bus 221 and the bus dropped me off on a road that is beside JUSCO , on the opposited side. JUSCO Bukit Indah seems to be regularly visited by many Singaporeans who would drive here to buy groceries (about 30% cheaper). I walked out and waited for bus 221 on the opposite side of the road from where I alighted, and it reached JB Sentral in about 45 minutes. I visited AEON Kulaijaya last weekend.. When returning, I simply walked back to the bus stop , crossed the road to the opposite bus stop to take the bus back to JB Sentral. AEON Kulaijaya, like other AEON malls, has a cinema and other F & B outlets. I watched ” Mission Impossible : Rogue Nation” there and left at about 8pm. I visited Sutera Mall today … I took the bus 1B from JB Sentral. The bus does not go there directly, so it dropped me at the main road .. where there is a sign “Sutera Utama” and a sign “Sutera Mall”… the direction points to another road turning left, so I had to walk about 10 minutes by the side of this road and i saw the mall. it has 3 levels, no cinema.. some F & B outlets. It is not an AEON mall… but it has a library on level 4.. however, you have to pay membership fees if you wish to borrow its books and materials. There are only 2 levels in IOI mall .. it is not run by AEON. But it has a cinema .. I watched ” Fantastic Four” at the LFS (Lotus Five Star) cinemas for RM 14. After watching the movie, I went to eat fried chicken at Marry Brown’s fast food outlet there .. YUM! Better than KFC I think ..
Then , I walked all the way back to the bus stop opposite the bus stop outside Hospital Temenggong and took a bus back to JB Sentral. Forgot to mention, the only direct bus from JB Sentral to IOI mall is JPO 1 but this bus has specific timings .. other buses do not go there directly..
After walking around the place, I went back to the overhead bridge and took a bus back to JB Sentral terminal. I walked over to a row of shophouses where “Shang Ji restaurant” is located and ate a bowl of beef noodles. Then, I walked back to JB Sentral and took a bus to “The Zon” which sells duty-free goods. It is also known as “Berjaya Waterfront”. The bus only took about 10 minutes to reach there. The situation is the same… only the first level shops are open, the shops on the higher levels (There are 4 levels) are all closed. There is a hotel there and some pubs that open at night I suppose. After a short walk around, I took a bus back to JB Sentral. I wonder if there are any more malls to visit in JB ? After that, I walked out of the mall to a nearby coffeeshop and had my dinner before walking back to JUSCO and taking a bus back to JB Sentral. Wow u went to U Mall? It’s far in Taman University. I also watch the movies there n its MBO cinemas like the 1 at KSL City. Cheap tickets from as low as rm9.43 per pax. Any ideas if there’s a taxi at Aeon Tebrau or Jusco Tebrau that can bring us (family of 6) back straight to Sg? Probably going to visit JB next month. Thanks in advance for any input given. Hi Christine, you would have to pre-arrange a private car/taxi to do so. There are options on Google that you can find more information on. I suggest you go for a SG-registered company that has Malaysian-registered vehicles as I find them more reliable. I’ve not seen any JB-to-SG taxi service provided at the mall and I wouldn’t recommend those touts hanging outside the entrance area too. Do u know what bus can take from JB Sentral to Mount Austin and where to alight? Hi Flora, BET6 does go to Taman Mount Austin but it’s better that you check with the bus driver where exactly in Mount Austin you’re heading to then you can let him know to alert you when you’re nearing your destination. Cheers. Is there a Hypermarket in Aeon Tebrau City? Is it any good? Lots of variety? Hi Hendy, yep there’s AEON supermarket at Tebrau City. Space is huge and I would say variety is more than sufficient. There’s also TESCO next door if you need more choices. Try Tesco Extra for better shopping experience n free membership. Aeon member need pay annual fee. Points accumulated can be exchanged for coupons which are essentially cash. And they send coupons to your home in sg!!! I want to vist Austin Heights Adventure theme park. Is it very near from Aeon Tebrau city? From what i see bust Bet6 goes there? Hi Susan, the theme park is not very far from AEON Tebrau City. You can roughly gauge from google map. And yes, BET6 will take you there but please check with bus driver on exact spot to alight. Hi, I suppose you mean the Tuesday evening pasar malam that’s just behind The Store? If so, you can take Maju 225 from JB Sentral. Just tell the driver to alert you when you’re nearing the stop. Safe travels! Is it really the biggest? Have u tried the pasar malam at Taman Ungku Tun aminah on Saturdays? i thought that is the biggest? Lol. It’s near the 777 hawker centre. thank for your info as it is very helpful. 1 thing that i want to ask is is there any pedestrian bridge to walk to opposite pick up point when back ? or we need to walk through the main road with many cars? Hi Andy, nope there is no bridge so you’d have to cross the main road. I think the carpark upgrading works might be ready by now and the bus might be able to go into the AEON compound so just tell the driver to alert you when its time to alight and also confirm where pick up point for return trip is. aeon to jb sentral – have to cross the road to the opp side of the shopping centre? The bus will drop you along the main road outside the carpark. For return trip, please refer to the images above where I’ve indicated the pick up point – yes, you need to cross the road to the opposite side. Thanks for the fast response. Really appreciate it as i am going JB tomorrow. No problem. I don’t remember the road being very busy. It’s not a super huge road so it shouldn’t be an issue. Is the bus service BET6 (Causeway Link bus) still operating as of now (Jan 2017) from JB Sentral to Aeon Mall Tebrau City? Would appreciate your update. Thanks from Spore. Yep, I just took the bus today. In JB now. I would like to know if the return trip is still the same as that time when you posted? Is it very ulu and dark? There is not proper bus stop right? Yes, it’s the same. IKEA is being built on the piece of land behind the flyover so unless you’re in a group, avoid waiting there by yourself when it’s dark. It’s not ulu because it’s along the busy main road (unless you’re there really late at night and there are less cars) but there will only be street lights when dark. No bus stop. Hello JA, good to hear from you again. 🙂 It’s probably time to revisit the malls now. You may want to include AEON Tebrau City too because it now has a new wing with more retail shops and dining options. JB has caught on a lot of food trends in the last 1-2 years and has many new eateries and food places coming up so I think it’s worth checking them out and see what’s new to try. I visited Pelangi Leisure mall today. I had looked at google map to see where the mall is the day before. Then I walked through the nearby landed houses estate followed by a row of shophouses to reach Pelangi Leisure mall. The mall has two levels. The first level has Mary Brown outlet and GIANT Hypermart. The second level has a Watson’s shop, a roti prata shop and a tailor shop. After having my food at Mary Brown and buying a few things at GIANT, I walked back to Plaza Pelangi mall and took a bus back to JB Sentral. forgot to mention I crossed the overhead bridge after I alighted opposite Plaza Pelangi mall .. If u happen to visit Pelangi Leisure mall , I would like to recommend a delicious (and cheap) roti prata shop at a row of shophouses on the left side of Pelangi Leisure mall …. look for the shop “Mohammad Salleh prata” in red. Haven’t been back to JB recently so I’m not sure if there may be changes to the bus. Went in January and June this year but all remained the same so no updates from me. For info, BeXTRA6 = BET6. I’m using BET6 as that’s what they put on the screen in front of the bus but on the side, the bus name/type itself is BeXTRA. Alighting spot can be anywhere on that same road – depends on the driver and when you press the bell. I’ve alighted nearer the new carpark building before and also slightly further down the road away from where I’ve pinpointed in this post. Seriously, they have no rules so don’t expect it to be ‘Singapore standard’, haha.😆 But it’s easy to spot AEON Tebrau so you shouldn’t miss it. And you can always tell the driver to alert you when you’re nearing your destination. Travelling time is always estimated depending on traffic. What I’ve given here is just a general feel of my previous journeys so you can use that as reference. Going there by bus is very easy and convenient. If you’re not sure where to alight, just ask the driver to alert you when nearing the destination. And for the return trip, it’s very easy to spot the flyover so long you follow the direction as indicated in my post above. In fact, when you alight at AEON, just look across the road and you should see the flyover anyway. I do not recommend waiting for the return bus in the dark because the flyover area is not very well-lit and it’s very quiet so if you’re late, just take a taxi. All in all, shouldn’t be much of an issue so go ahead and enjoy yourself. Happy eating and shopping there! Just saw this. Thanks. I am planning to explore Aeon Tebrau and the surrounding next week too. I am planning to go there and explore the surrounding too. So the bus will stop at the highway? Wondering whats is the charges now? 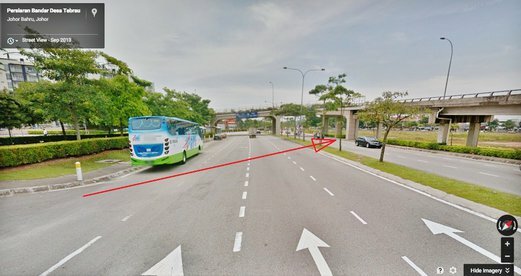 Bus will stop outside main road on the same side as AEON as indicated on my post. Only for the return trip then you have to cross the road to get to the flyover to wait for the bus to go back JB Sentral. So far till June this year, fare remained the same. If in doubt, just reconfirm with driver upon boarding. Next week, planning to visit AEON Tebrau city with 3 friends. Thanks for info. How long does it takes to reach AEON Tebrau City by Public bus? 20min from JB Sentral to AEON Tebrau City in smooth traffic condition. Bus goes via expressway so it’s very fast. According to your info, it takes about 20min. But when I google, it states 1hr55min to reach. So I’m a bit puzzle. What did you put as the starting point? I just checked on google map. The shortest route takes only 21mins from JB Sentral to AEON Tebrau City which is accurate. For me , I prefer to alight one stop before the AEON Tebrau city bus stop and then go through the underpass to the other side , and you will reach Johor Jaya. There are a few eating places I would like to recommend. Suppose you alight one bus stop before AEON Tebrau city bus stop, cross the underpass and you would come out the other side of the road and be at a Shell petrol station. 3) Coming back to the road again and continuing onwards, upon reaching the end of the road, which is when the line of shophouses end, you will see another road in front of you (traffic going left to right and vice versa). As you reach this road, make a left turn and walk on the side of this road for a short distance. Look to cross this road and climb up a short flight of stairs to a higher part of ground where you would see some landed houses. Then, turn left and walk along the road (keep to the the right side of the road)… You would be able to see a Night food centre at the end of the road. Do note that both Night food places start around 5pm. As there is no direct bus to these places, it is preferable that you drive. If not, do take note the walk from the bus stop you alight at the main highway to the Night food places is about 1.5km. I would recommend you to reach there early and finish a bit earlier so that you could walk back to the main highway and catch a bus back to JB Sentral, before bus services end for the day. Another Night food place I would like to recommend is in the area of Tungk Ungku Tun Aminah (TUTA). 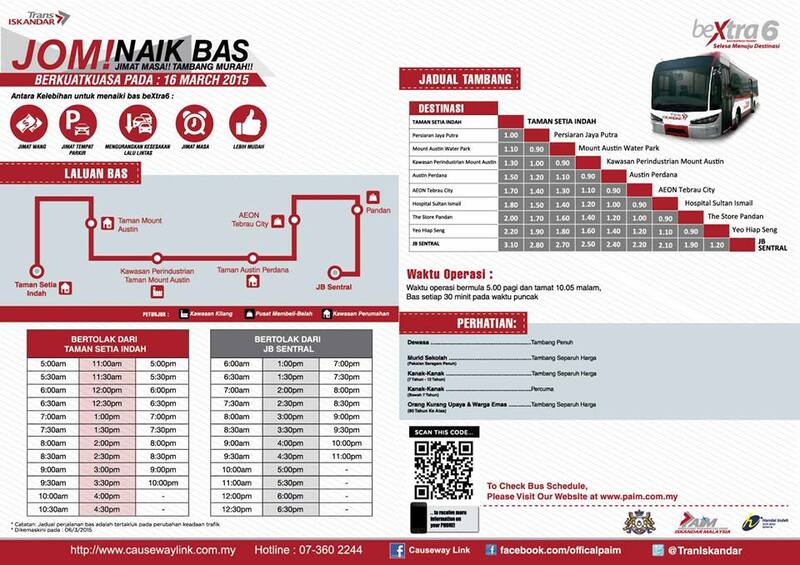 Just to clarify … the bus journey from JB Sentral to TUTA (a residential town) is about 20 min. Basically, the bus will turn left from the highway and enter TUTA. The bus will wind through TUTA town. Hi Geri and JA, would you recommend travel solo to Tebrau City? I am a middle-aged female Singaporeans. I went there with a colleague yesterday by bus, but got problem locating the return bus pick up point, in the end took a cab. Yep, shouldn’t be an issue to travel alone. I was there last week and there’s no change to the return pick up point. Walk out the exit from AEON supermarket and turn right to the main road. You’ll see the flyover so just cross the road and wait under the flyover where there are bushes along the sidewalk. Not difficult to find at all. As there is no specific bus stop for the return journey, so long you’re on the other side of the road, just flag down the bus when you see it. The driver should still pick you up. Safe travels and good luck. I’ve gone in alone many times already and I always take the bus or walk. Never took a taxi there before. I’m a guy. Hi Geri & JA,we will be staying at KSL Resort and would like to visit one of the AEON malls. Going thru the few posts on “how to get to…”, I think that AEON Tebrau City could be a good choice because of bus 227. In one of the older comments by JA, it was mentioned that 227 goes to Pelangi Mall. I did a search and looking at Google Map, I thought we could drop at Crystal Crown Hotel and walk to KSL City via the residential estate along Jalan Rusa. Am I correct? So may I also check where could I wait for bus 227, is it the same as BET6? I am assuming are coming from JB Sentral bus terminal after customs? If so, u can take a bus and drop at Crystal Crown hotel and walk a short path thru the residential estate to KSL. But there is actually a DIRECT bus from JB Sentral to KSL , the bus is called “S1”. Many ppl going KSL will take this bus. The bus fare is RM 1.50. I think u might want to take this bus instead. It will bring u to KSL directly. Aside, U mentioned about Pelangi Leisure mall. There is NO direct bus there. I alighted at Crystal Crown hotel and walked thru the residential estate etc (U can check the google map on how to walk from the hotel) to reach the mall. The buses to take from JB Sentral are 227 , and some other buses. Unlike in Sg where we go by bus number, in JB,it would be better to look at the destinations listed on the display board at the front of each bus to know which bus to take. Hello, what bus to take from JB Sentral to Plaza Sentosa ? There is no direct bus from JB Sentral to Plaza Sentosa. U need to alight at the main road and cross the road and then walk along the row of shophouses to reach Plaza Sentosa. The buses to take are those (look at the destinations on the display board at the front / side of each bus) with terminal destinations of MASAI , KOTA TINGGI (bus 227 is one of them) , ULU TIRAM.